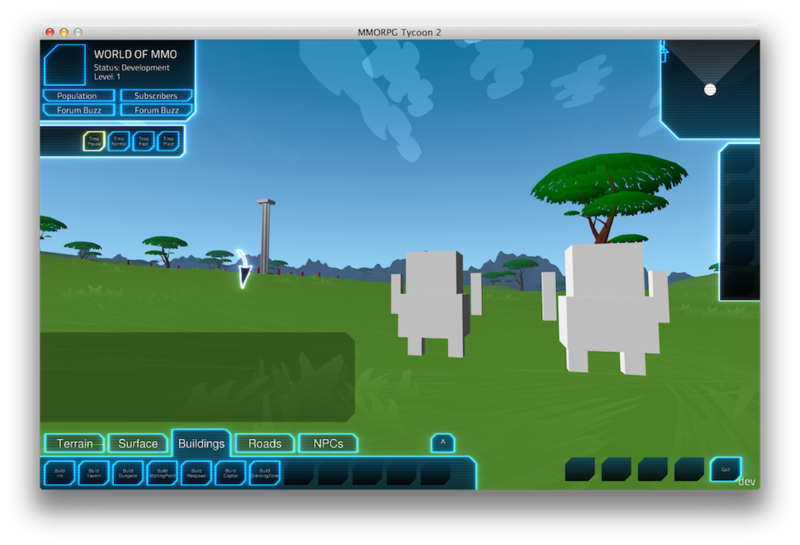 I’ve finally gotten around to starting on implementing the simple “block” representation of player characters in MT2. For quite a while, I was thinking about using sprites for the player characters, perhaps similar to the simple, iconic ones in Prison Architect. But because our camera can zoom right down to ground level, I felt that that approach wasn’t going to fully work. So instead, I’m going for a very simple blocky “low-polygon” look, I think. 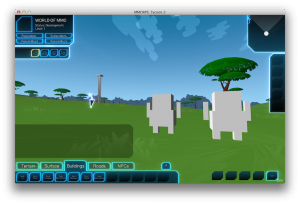 This is a screenshot of the very first time I ran MT2, using procedurally generated models instead of simple blocks. The characters’ arms are connected to their torsos at the elbows, rather than at the shoulders. Whoops. Also, I’ve clearly done something wrong with the body proportions; I had intended for these guys’ heads to be larger than their bodies. That obviously didn’t turn out quite as I’d intended. Also not visible from this screenshot, but these guys are actually travelling to the left — they’re not facing their direction of travel. In fact, the whole MMO simulation engine doesn’t know or care about the facing of simulated PCs. This was the biggest surprise for me — it hadn’t even occurred to me that this was going to be a problem. I suspect that I’ll probably end up faking the orientation of characters in the game; there’s probably not much point to rigorously simulating which direction everybody is facing. I’ll just draw them so that they appear to face the direction they’re moving, or the monster they’re fighting, and that’ll probably be good enough. (I did that in the 1.1 prototypes, where PCs and monsters were represented by sprites that could be facing to the left or right) Testing will possibly prove out whether or not faking orientation will work out well enough. These guys are actually about three meters tall. I’ll need to shrink them down a bit, once I’m happy with their proportions. Also, obviously there are no textures or animations on them yet. That’s coming, once I have general body size and shape more or less where I want it. 10 June, 2013 in Full Games, MMORPG Tycoon.